Visit us online for all the latest WLAC news! Starting this year, World Languages and Cultures will transition away from our traditional print newsletter, WorldNotes. Technology has changed so radically since we first began this project that we now have the opportunity to reach the entire world every day instead of reaching only our alumni once per year. We offer our heartfelt thanks to all the editors, writers, designers and others who sustained this project over the decades and kept us in touch with each other! To remain engaged with our alumni and connect the generations of Samford language students and faculty, we will publish our news, as it happens, on the World Languages and Cultures homepage. Our 2016 year-in-review is below, with links to many wonderful stories. The biggest news of 2015-16 is that WLAC has moved its offices to the third floor of Dwight Beeson Hall! It is a wonderful space, and we encourage you to visit us in our new home. A friend in Spain informs us that our graduates are “filling up” the country. We had five there this year, and many more serving around the globe. Please get in touch with us and share your adventures! We’re willing to entertain other claims, but as far as we know Heather West is Samford’s first French knight! WLAC faculty have earned this and many other honors this year, and maintained our reputation for outstanding teaching and research. We signed a new exchange agreement with the University of Grenoble this year and sent our first student there in the fall. We will receive our first student from Grenoble next fall. We had exchange students from Japan, Germany and Argentina again this year, and successful study abroad programs in Spain, Costa Rica, France and Germany. We became part of a consortium with Hollins University’s house in Paris. Our German study abroad program received its largest gift ever this fall, which will be used for scholarships. WLAC created a series of innovative practicum options for Spanish 202 students. The eight options highlight faculty expertise, connect language to culture, promote global awareness and develop workplace skills. The options allow students to create a custom course experience that speaks to their unique cultural and career interests. We are also teaching each other in the department with a new learning communities initiative. Professor Emerita of Spanish Myralyn F. Allgood published a celebration of almost three decades of Samford’s role in the Rio Grande mission program founded by Elmin Howell. Summer Missions on the Rio Grande: A Collective Memoir of Samford Students in Ministry, 1975-2003 was a labor of love for Allgood, who first visited Texas four decades ago to learn how Samford students might participate in the program. 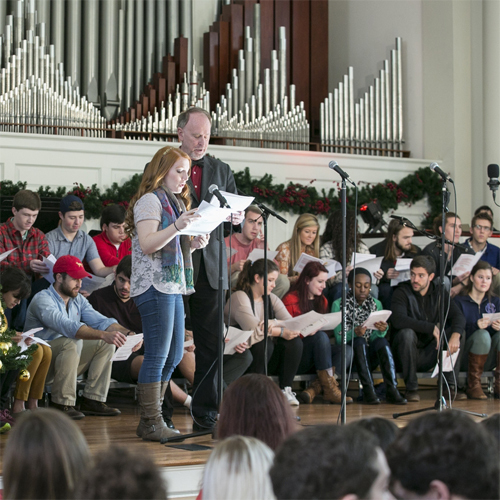 Our annual Christmas Around the World celebration of language, culture and faith remains a highlight of Samford's holiday season. We presented our annual student honors April 8 and came together again April 25 for our growing Samford University Eurovision Appreciation Night, led by our own “professor of Eurovision” and department chair Mike Ledgerwood. The family and friends of Dr. Grace Ezell Weeks Márquez, including generations of her “hijos de la lengua” among Samford’s students and faculty. Read Myralyn Allgood’s remembrance of our beloved friend here. WLAC department chair Mikle Ledgerwood, daughter Rhiannon and sons, Ian (‘15) and William ('19) on the passing of their wife and mother, Fayanne Thorngate. The family and friends of John Gary Wyatt ’01, who lost his life in an airplane crash Aug. 27. The president of Wyatt General Contractors was a Samford Spanish minor and alumnus of both the Samford in Spain and Samford in Costa Rica study abroad programs. Follow us here or interact with us regularly at Samford World Languages and Cultures on Facebook. However you want to do it, please stay in touch with us and help support our vitally important mission!